Everead: Design Mom in Atlanta: Or, Why I Love Book Events. Design Mom in Atlanta: Or, Why I Love Book Events. "Did you really invent the blog giveaway?" That was my burning question for Gabrielle Blair at her book event. Don't worry, I was very polite and did not ask it during the part where we were supposed to be talking about her book. 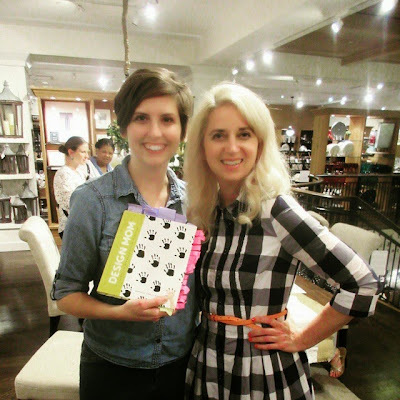 I attended the Atlanta stop of the Design Mom Book Tour at Lenox Square Mall a couple weeks ago, and it was so much fun, start to finish. I showed up right on time (not too nerdy) and brought my tabbed copy of the book (pretty nerdy), and gave away a bunch of my blog business cards (definitely nerdy), and made so many germane comments about the book during the Q&A that Gabrielle's interviewer thought I was her publicist (off the charts nerdy-awesome!). I had so much fun! I met a bunch of cool new people like Faith and Stacey and Rachel and Bliss and Titania and of course Gabrielle. I didn't take enough pictures though. This happens at every book event. I take out my camera, take some pictures, look at them and think, "that's good, that's enough" then get home and look at the photos and see that I only actually took two and they were both pretty horrible. Sigh. Can't remember the name of this awesome gal from Lebanon. For shame! My favorite part of the Q&A was when Gabrielle told the story of a trash can. She had bought it because it looked so good. However, this trash can's lid was constantly getting stuck and making it difficult for her kids to properly dispose of their garbage. Just get rid of the trash can, she advised. "There's no object in your house that's worth you yelling at your kids." One of the best things about good design, according to Design Mom, is that it scores you tiny wins. If you wake up in the morning and on your way to the kitchen you stub your toe on the dresser every time, that's a "friction point" and one of the small problems you can tackle from the perspective of design. How do you even start? Gabrielle suggests taking it one room (or one part of a room) at a time. I have really enjoyed watching her live by this advice as she has posted tours of different rooms on her blog. She's a designer for a living, and yet it's so encouraging to me that when she moved to a new place it wasn't all done-up and blog-ready in 6 months. Just, phew! I've got time. We had a plate like this (but red) when I was growing up, and I've wanted one ever since one of my siblings broke it. I don't remember who did it or what the circumstances were, but it was so funny when Stacey, my partner in crafting, confessed that she had been the one to break the special plate when she was younger! :) No worries kids, now I know how to make us a replacement. After the crafting and such, and with the encouragement of my new friend Bliss, I asked Gabrielle my question. "Did you really invent the blog giveaway?" Yes, she said she had been credited with running the very first comment-to-win giveaway. Wow. So awesome. Her tracking software, Traxi (which pre-dates Google Analytics), had told her lots of people were reading but she knew not many were commenting. She wanted to get to know her readers, so she offered a prize for commenting. Within the week other bloggers were emailing to ask if they could copy her directions and companies were emailing to ask if they could give away their products through her. Pretty amazing. I had one last question for Gabby: "Can we be best friends for life?" Affirmative. Hooray! Haha! If you enjoy a recently released book, let me tell you that going to an event for that book is a fantastic idea. Not only will you get to meet the author, but you'll get to meet lots of other cool people who like the same book you do. I'm such a fan of book events. more book signings I've been to: one, two, three, four, five, six. my review of Design Mom: Living with Kids: A Room-by-Room Guide. This place is perfect for any kind of night you're looking for. In the downstairs area at this event space, you can enjoy a lounge setting while talking over drinks with a small party. Or, if you're looking to mingle or have a bite to eat, you can head upstairs. Are you talking about the Pottery Barn? Or one of the event spaces on eventup?